***The following content is in no way sponsored by or affiliated with Amazon. Any links are NOT affiliate links. Momma Told Me: Why don't you pick out something nice for yourself? I've been spending a lot of time on Amazon lately. I've been testing products and participating in study/focus groups since my college days. Though the years I've earned elite status with many organizations and social marketing venues, simply because I was there when they began. As a result, I seem to have a constant supply of points and rewards I chose to redeem in the form of Amazon gift cards. Sure, I COULD order household needs on Amazon Pantry, and sometimes I do put them to practical use but, for the most part, I rely on them to fund my various blogging projects (Need a glass frog for a photo shoot? Amazon has it! And it's here in 2 days!) and to try new things I'd never otherwise consider investing in. We've had our fair share of RC 'toys' in our home, but the majority of them are child oriented and fairly cartoony. 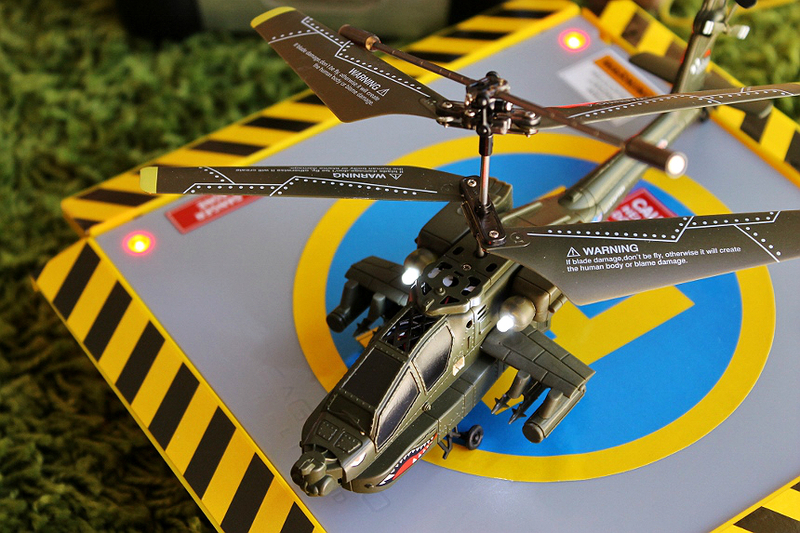 For a while I've been wanting to play with a remote control helicopter that responds similar to an actual helicopter (starting with the correct number of blades would be great.) So I did a lot of reading around and the brand Syma kept coming up. I'll admit, I passed them up time and time again because their average model was priced under $30, and that's quite low for an RC aircraft. 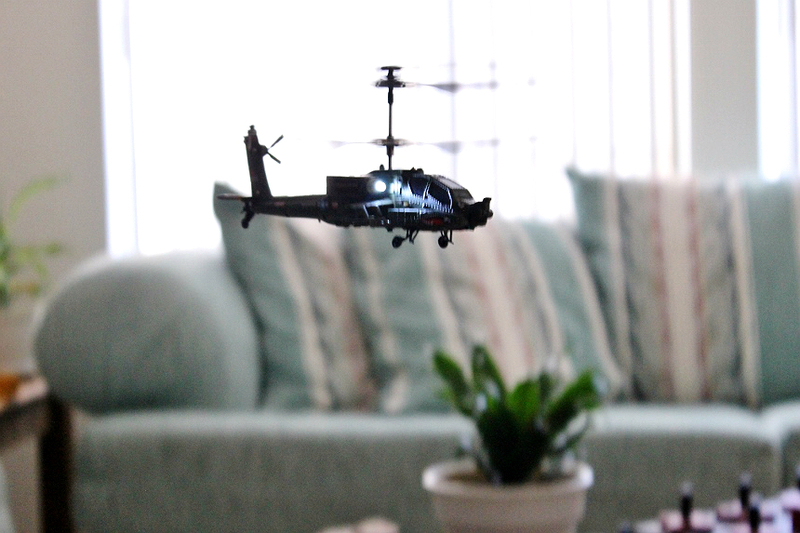 Well, as luck would have it, I invested in a light up helipad (yes, I know, I'm a nerd) and an opportunity came to me to play with the Syma Apache S109G. The Apache is beautifully detailed and very lightweight, to the point was certain I'd wreck it in 5 minutes flat. I seldom see realistic aircraft models under $75, so, again, I was skeptical about performance. 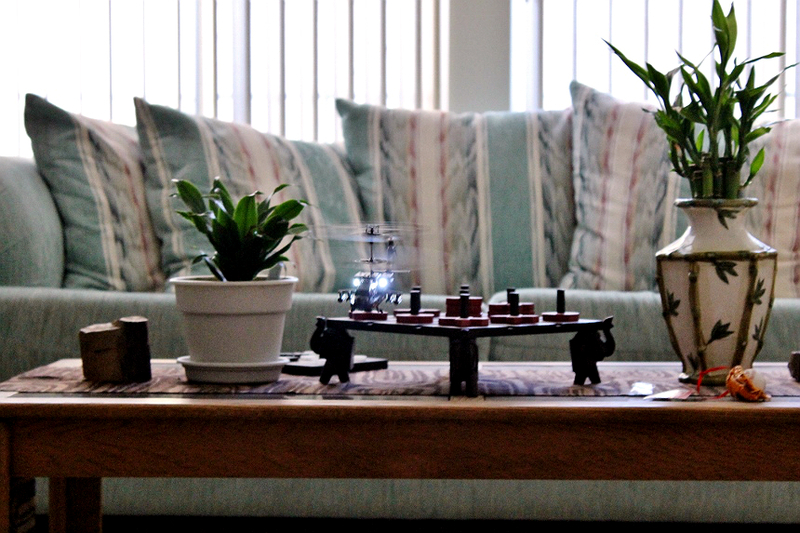 Well, I'll save you the nitty gritty- This little indoor RC copter is incredibly fun. Even Jay, who has poor hand coordination and easily gets frustrated, found himself resetting the copter to it's start to try, try again. I, on the other hand, was able to get several minutes of flight out of it before I downshifted too fast and cut the engine (whoops!) Let's just say this little Apache took plenty of a beating and kept on lifting back off! The gyro feature makes it exceptionally responsive and perfect for beginners, while offering a full range of 360 flight movement for the advanced. 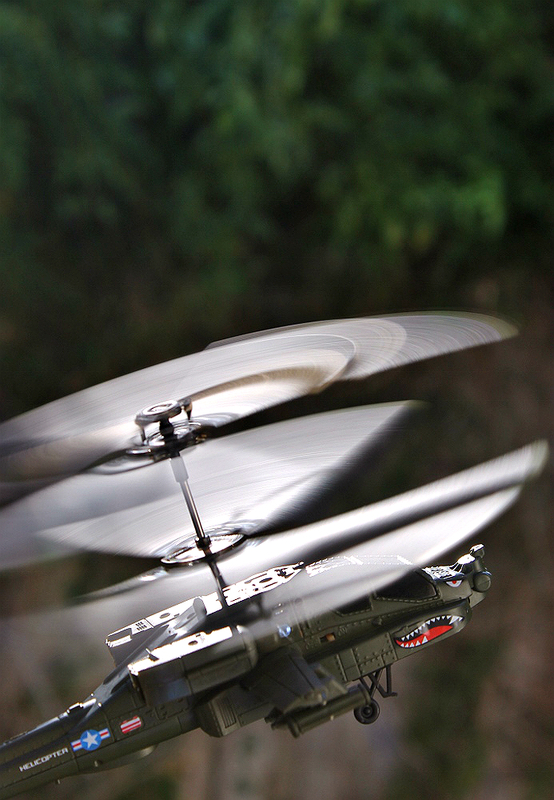 I don't think we own a flying RC unit that picks up as fast, or responds as authentically to common aviation physics. I don't rave often, but this was a gem of an Amazon find that is well worth the money. And, if you're like me, remember, it's Amazon, so you're covered if anything arrives wonky or it just isn't a great fit. The holidays are just around the corner- You better believe I've begun my shopping on Amazon! And, since I think the best prize is one you can pick yourself, our final Blog POP! School Rules giveaway will be for a $100 Amazon gift code! But this giveaway will be run a little different- I'll be handing out an entry for every Blog POP! School rules giveaway you enter- so make sure you keep hopping along. And no cheating, I will double check every entry from the winner! Good luck, and happy entering! What Daughter Says: As we head towards the holidays it's easy to get caught up in the stress and shopping lists. Don't forget to treat-yo'self too! Hop along to the other amazing Blog POP! School Rules giveaways below and keep claiming entries towards the $100 Amazon gift card prize! I'm not sure how long I've been a follower of yours.. maybe about two years or more? I won a really neat prize last year, a Bio Bubble! I love these great giveaways! I've been following for about three years I believe! This is my second BlogPop event I'm participating in and I want to thank you and everyone else involved for such a fun and generous event! I don't know how long I have been following your blog. This is my second Blog Pop. I love entering giveaway. I try to enter at least 50 giveaways a day. I have been a follower for about 5 years and I think this is my 3rd Blog Pop. Hi :) Do I need to post here which giveaways I've entered? I just entered Still Blonde's..Thanks! I just found your site today! So I am a recent follower and look forward to all you have to share! I have been following Momma Told Me for a couple of years now. I have entered several of the Blog Pop events and really look forward to them. I have been a follower for about a year now. This is my first blog pop! I have never heard of them before! I have been following for a couple of years - always enjoy Blog Pop events. Thanks! Entered Still Blondes, Daddy Mojo and Adrea's World Reviews. thanks! I am not sure exactly.I know it has been over two years! I have been following for maybe 3 yrs and I try to enter all the Blog Pop events. I am a newbie here :) Thanks for the contest !! I've been a follower for a few years. I always enjoy your posts because they include detail and great styled pics. this is a great giveaway hop because it has some neat prizes. I really like the fandango gift card and the keyboard. I've probably been following for maybe a year or so. This is my first Blog Pop. I LOVE it! These are great. So many great prizes on top of a few new blogs that I've found through the hop. Thank you for coordinating! Do we need to tell you each giveaway in the blog hop that we've entered? I've entered quite a few of them, but skipped some where I knew I couldn't use the prize. Thanks! That sounds awesome and thanks. I just discovered you and this great giveaway blog hop today! There are so many great prizes and a couple I missed because they were over! I'll need to pay attention to your blog so I don't miss any others! 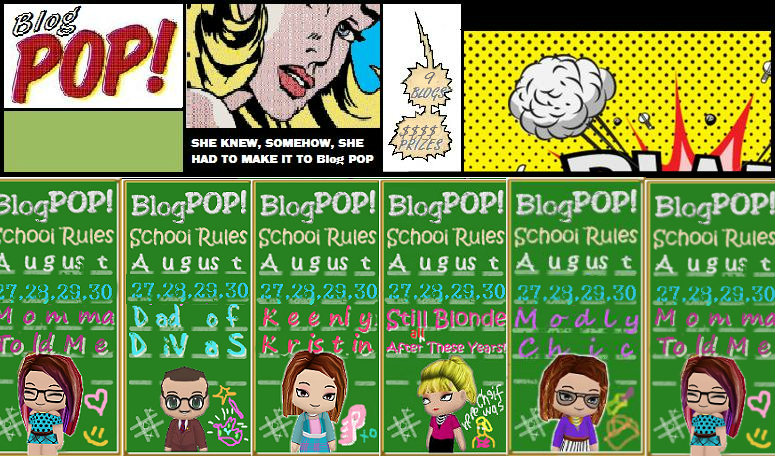 I've entered all the Blog POP! Events so far. I've been a follower of your blog for a couple years now, and enjoy it. Thanks. Since I'm lazy I'll just give you the numbers of the ones I've entered: 2, 5, 11, 15, 20, 21, 26, 27, 29, 31, 33, 35, 36. ENtered a handful, from you, 2, 4, 15, 16, 18, 20, 21 . Got a late start. Thanks for sponsoring! Not sure what we need to do for this. I have been following you for a few years? I've been hopping over to your site for great giveaways the last few years. I missed most of these giveaways but entered from 9/12 on. I just discovered your blog today and I look forward to all of the great content you will have, especially recipes and giveaways! I've entered many blog hops but never heard of a blog pop before! I think I have been following your blog for at least three years because I have entered the Blog Pop event for that long. I probably discovered your blog through a blog hop and stuck around for the giveaways. I think I've been following awhile, at least a couple years. I'm not sure how many blog pop events I've entered but I try to enter them when I see it come up! Go seahawks! I have been following your blog and enjoying entering your giveaways. I don't remember how long but it must be at least a couple of years. I entered 5 Blog POP! Events. Thanks for the awesome giveaways!